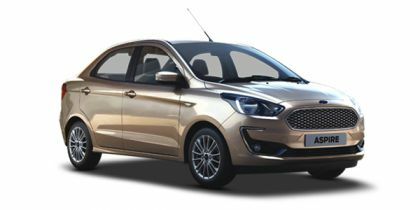 Ford Aspire price in Delhi starts from Rs. 5.71 lakh (Ex-showroom). Aspire is available in only 13 variant. Ford Aspire's top competitors are Honda Amaze (price starting at Rs. 5.86 lakh in Delhi) and Maruti Swift Dzire (price starting at Rs. 5.70 lakh in Delhi). Q. What is the price and review of Ford Aspire all diesel models? Q. Which is best in terms of safety, economy and comfort among Tata Zest, Ford Aspire and Honda Amaze? Q. What is the maintenance cost of ford aspire? Q. Which is better in terms of petrol engine, comfort, maintenance between Amaze petrol and new Aspire petrol? Q. Which will be better choice for a senior citizen, Ecosport Trend Plus automatic petrol version or Aspire 1.5L petrol within a budget of 10-12 L?